Ready to nestle into your home or garden, our metal turtle will create a bright spot in any location. Turtles represent patience and wisdom as well as being symbols of long life. Inspired by nature, our texturally painted turtle has a bobbing shell, head and tail when touched. Measures 43cm x 18cm x 27cm. Turtles are said to bring good fortune. Our stacked turtle family statue will bring you three times the happiness. 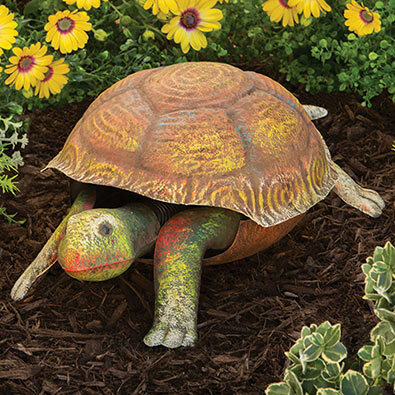 Artistically sculpted of weather resistant polyresin and hand painted with realistic details, our turtle sculpture will bring instant whimsical flair to your yard, patio or garden. Measures 23cm x 27cm x 16.5cm.